'That this Association has heard read, with feelings of unmingled satisfaction, and unqualified approval, the paper communicated by Samuel Pickwick, Esq., G.C.M.P.C. 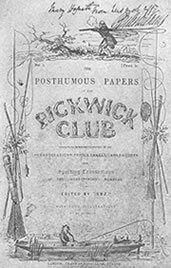 [General Chairman--Member Pickwick Club], entitled "Speculations on the Source of the Hampstead Ponds, with some Observations on the Theory of Tittlebats;" and that this Association does hereby return its warmest thanks to the said Samuel Pickwick, Esq., G.C.M.P.C., for the same. 'That while this Association is deeply sensible of the advantages which must accrue to the cause of science, from the production to which they have just adverted--no less than from the unwearied researches of Samuel Pickwick, Esq., G.C.M.P.C., in Hornsey, Highgate, Brixton, and Camberwell--they cannot but entertain a lively sense of the inestimable benefits which must inevitably result from carrying the speculations of that learned man into a wider field, from extending his travels, and, consequently, enlarging his sphere of observation, to the advancement of knowledge, and the diffusion of learning.